The time between being presented with the challenge and receiving a timeout was a mere two seconds. 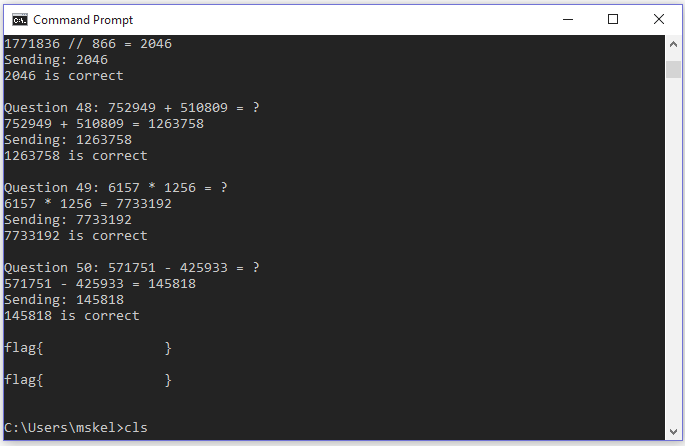 Although handy with a calculator this wouldn’t be possible without a script/bot. I also noted that the response and timing to answer didn’t change on a second connection, but the base operator did. 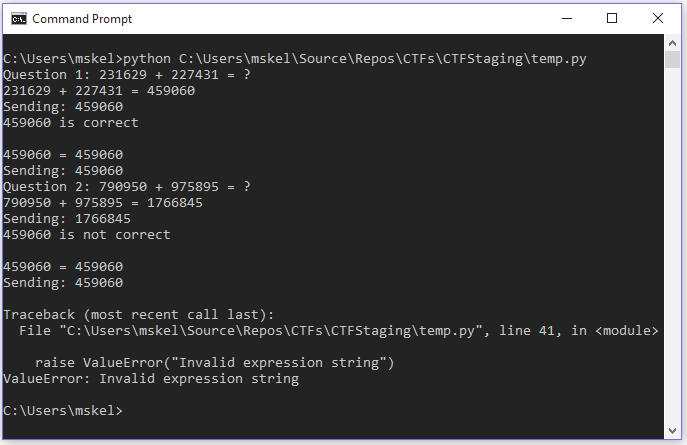 I then felt comfortable writing a script to connect to the host and return an answer to basic math questions (+-/*). This would skip everything proceeding the colon and whitespace and then group both sets of numbers, and the whitespace/operator between them for evaluation. I spent far more time on this part of the challenge than I care to admit. I didn’t entirely read my logs and spent my time stuck on the two lines where I have Sending 1766845 and the response 459060 is not correct and put a lot of focus into trying to identify why a different response was being sent to what was calculated (not the truth, but it’s what I was thinking). And then the next question would be presented. This was causing issues with my regex as I was passing values from the previous answer into my group, ultimately preventing the correct evaluation from sending. Essentially the same as above, but it would now capture two digits over one as I didn’t expect the challenges to go past 99 (although could use \d* if they were to). I hope this helped you to better understand how to approach this kind of programming based ctf item. If you’re Brisbane based, or find yourself here be sure to check out SecTalks.